A website’s Internal link structure is one of the most important on-site SEO factors. 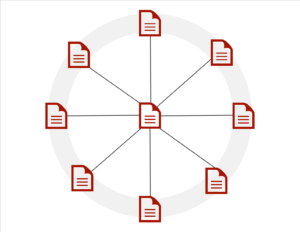 Internal links work together with site structure to give search engines a clear picture of the content of your site, makes it easy for users to navigate related content and distributes link equity to pages deemed most important. 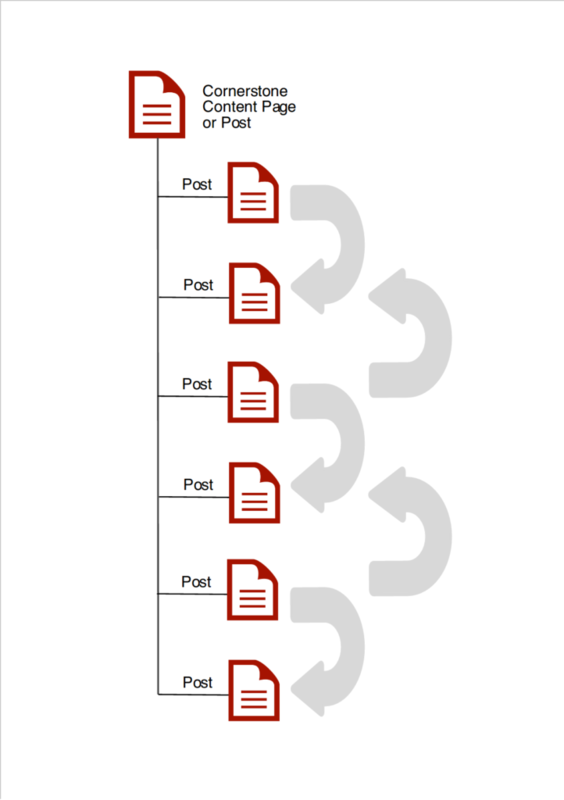 Linking your content creates a hierarchy of your content. You can picture it as a content wheel or better yet a book’s table of contents. The images are just a representations. How you link will not have an exact pattern but depend on your content and goals. There is the main page or what Brian Clark of Copyblogger calls “cornerstone content” and then supporting posts. As Copyblogger recommends, you will want your “cornerstone content” to be pages, not posts. You want to use pages instead of posts because first they won’t get lost in your blog feed and second pages don’t have dates, so they won’t seem outdated. Cornerstone content pages are a great demonstration of content hierarchy that search engines can understand. It also gives you the benefit of targeting short tail keywords that are much harder to rank. How to Internally Link Content. A traditional cornerstone content page is just a resource page. They are pages that have links to content related to the topic of the resource page. I want to discuss a slightly different method of leveraging your content to create cornerstone content. Instead of linking from the cornerstone content we are going to link from the posts to the cornerstone content using the keyword you want to rank. 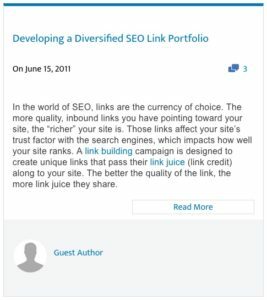 Let’s look at an example, WordStreams “Link Building – How to Build Links for Free.” It ranks for over 100 keywords on the first page of the SERPs including the competitive keyword “link building” and is also listed in Google’s Answer Box. It would be incompetent for me to pretend I know exactly what the strategy is behind this but I can assume the links on the page linking to other pages is to leverage the authority of this page to help these other pages rank. The one link directly related to link building is “Link Building Strategy.” This page is a traditional cornerstone content page full of links to related articles by Wordstream. So what strategy is Wordstream using? Examination of an Internal Link Strategy. When we look at the incoming internal links to the main page “Link Building – How to Build Links for Free” things start to get interesting. Let’s examine some of the on-page SEO optimization found in the 24 posts linking to this cornerstone page. URL – 20 of 24 posts. Title Tag – 20 of 24 posts. H1 – 19 of 24 posts. First 100 words – 16 of 24 posts. Anchor text – 21 of 24 posts. Also the keyword “link building” is used in some form as an internal link to the main page usually within the first 100 words. This also allows it to show in the description of posts on taxonomy pages such as category pages. Now let’s dig a bit deeper into the articles that are linking to the cornerstone content. The first thing I noticed was the articles are written between 2009 and 2011. The first version of the cornerstone content also appeared during this time. This makes them over five years old. Ancient in internet years. This leads to the second observation. All the posts have a “date modified” date of 4/3/2015 or 8/17/2015. That seemed pretty suspicious, so I reviewed the old pages and compared them to the new ones. The additions of “date modified” in the schema. The removal of “about author” in some articles. I didn’t look for changes such as fonts, headers or the sidebar? From my observations, not much has changed except linking to the cornerstone content and alerting search engines to the modifications. Infographic Detailing The Internal Linking Strategy. What Is Powering This Page? Each post I examined has PA>30 some as high as 50. Posts have backlinks from over 100 unique referring domains which means 100’s of backlinks. So we can see this page has a lot of support. None of this takes into account the domain authority of the website or backlinks to the actual page. It is easy to look at an article and assume that it is ranking well because the domain authority of the website that published it is high. The domain authority is important but what is more important is how authoritative a search engine sees a website relating to the content published. If caranddriver.com publishes an article on “How to care for your cat.” the domain authority isn’t going to help much. Search engines aren’t going to see that site as an authority on the subject. If you have a site that has a lot of content, find your most important content or create cornerstone content that ties everything together. If you are interested in finding out how I went about creating this study or how to discover what articles should be linked leave a comment below. If I see enough interest, I will write an article detailing the process.